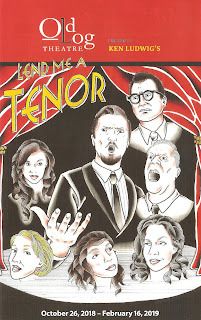 Now playing at the oldest continuously operating theater west of the Mississippi: the madcap comedy Lend Me a Tenor. Although written in 1989 by playwright Ken Ludwig (see also the madcap Sherlock Holmes comedy Baskerville), the play is set in 1934 and harkens back to the days of classic film comedies like It Happened One Night. Old Log Theatre has taken that cue beautifully, and created a piece of theater that feels like one of those old movie comedies come to life, except in three dimensions and full color! With a sparkling eight-person cast, sharp design, and impeccable timing on this complicated farce, Lend Me a Tenor makes for a fun night at the theater. Combine it with an afternoon or evening spent shopping and/or eating in the almost too charming lake town of Excelsior (which, when I visited, featured a horse drawn buggy and softly falling snow on the beautifully lit main street), and you have a wonderful day in the western suburbs of Minneapolis. Lend Me a Tenor continues through February 16, the snow will probably continue much longer. Director Eric Morris gets fantastic performances from his cast in that sort of heightened farce style. There are a lot of comings and goings through those many doors, and scenes mirroring each other on either side of the center wall, and it's all executed perfectly. And the cast looks gorgeous in designer Morgan Potter's luscious period costumes. Head west to Excelsior between now and February 16 to catch this fun and funny show, especially if you're a fan of those great old film comedies. Click here for more info and to purchase tickets. This was a fantastic play! Great entertainment - we laughed so hard! A little too much swearing for our taste though!